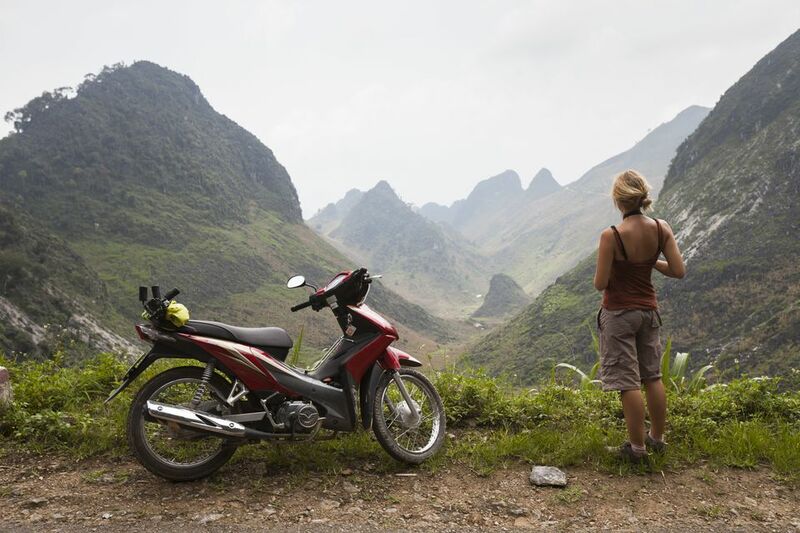 Renting a motorbike in Southeast Asia is a fun, cheap, and memorable way to get around. But there are some challenges for staying safe, both on the road and in the rental shop. Chrome and leather jackets are optional: The term "motorbike" is synonymous in Southeast Asia with small or medium-sized scooters, often no bigger than 125cc. The roads are usually clogged with them. Renting a scooter for the day is a great way to see local sights and provides more freedom than relying on public transportation. You can stop when and where you like, plus driving can be a thrilling, if not hair-raising, experience! A small scooter can usually be hired in Southeast Asia for as little as USD $5-10 per day. Many countries in Southeast Asia will allow you to rent motorbikes without an international license, however, not having one may give the police a reason to hassle you later. Sometimes a driver's license from your home country will do. Sometimes having an international permit doesn't matter if you're stopped — the local police will still ask you to pay cash on the spot! International driver's license or not, you will be required to leave your passport or a sizable cash deposit at the rental office. They need some guarantee that you aren't going to drive their scooter into the sea and skip town. You'll be asked to sign a rental agreement that makes you responsible for scratches and damage. Lots of people learn to drive a scooter in Southeast Asia for the first time. Unfortunately, lots of those same travelers also crash their first scooter — most often in Thailand. Thailand ranks among the top countries in the world for drunk driving crashes and fatalities. Even if a crash isn't serious, road-rash wounds become easily infected in Southeast Asia's humidity. Also, paying for damages — which are often greatly exaggerated by the rental shop — will put a real damper on your fun. Injuries that happen while on a motorbike are rarely covered by budget travel insurance policies. Begin by renting an automatic scooter rather than one with gears, and start out slowly on side roads with little traffic where you can get the hang of driving in Asia before proceeding to busier areas. Pai in Thailand is a very popular place to learn to drive a scooter; many travelers opt to drive the scenic route there from Chiang Mai. You'll find fliers advertising half-day lessons, or ask an experienced driver to show you the ropes. First and foremost, avoid a lot of potential problems by renting from established, reputable shops and agencies rather than from individuals who hustle tourists on the streets. Check the motorbike for existing damage; you could be held liable for scratches and dings later. Point out existing damage, and snap pictures with your phone before you drive away. Read the rental contract carefully. Some contain range restrictions or limit the maximum number of kilometers. Ensure that you have contact information for the shop in case you experience a problem later. You may be responsible for small fixes, such as flat tires, on your own. Fortunately, tire repair is cheap and easy to find. Make sure that your helmet fits well and won't shift around once you begin moving. If it proves to be awkward or uncomfortable, don't be shy about returning to the shop to swap it out. Get a chain for locking up your motorbike. You should run the chain through one of the tires when parking overnight or leaving the motorbike out of sight. If your scooter has a basket, ask for a bungee cord to keep items inside. Even a water bottle bouncing out of the front basket on rough roads could cause an accident. If you are inexperienced, opt for an automatic scooter rather than a manual one. Driving a scooter is easy to learn, but you'll have to leave the rental office with a little confidence to avoid stressing the staff. To start an automatic scooter, put the kickstand up, hold the brake in with your right hand (a sensor prevents the starter from working unless you hold the brake), and press the start button (usually a button accessible with your left thumb). Pressing the button on the right (the horn) while trying to start is a dead giveaway that you're a newbie! The throttle is far more sensitive than most beginners expect, so give it a slow, tentative twist until you get a feel for the torque. Test the brakes softly until you know how touchy they are; most wrecks happen because new drivers over correct or squeeze the brakes too quickly to avoid something in the road. Use the rear brake (left hand) more than the front brake (right hand). Unlike when driving a car, you'll need to train your eyes to watch the road ahead as well as what is approaching your front tire. What would ordinarily be a small bump in the pavement for a car may be enough to bounce you into the air! Driving in Southeast Asia can be chaotic; potholes, animals, sidewalk drivers, street-food carts, and everything else imaginable can get in the way — go slowly! No matter how hot the day is or how much it messes up your hair, always wear your helmet! Even a low-speed, comical turnover could produce a head injury. Most Southeast Asian countries have mandatory helmet laws, and wearing one may save your life. The helmet law may not always be enforced for locals, however, the police in some countries stop tourists without helmets to pay on-the-spot fines. Even if locals opt not to do so, wear your helmet. Adjust your mirrors while sitting in the driving position before you begin moving. If your helmet doesn't have a front shield, you'll want sunglasses to keep dust and insects out of your eyes. Be aware that items in the front basket have an uncanny habit of bouncing out into spinning tires. Rain can turn driving conditions from enjoyable to perilous. Know if bad weather is coming before driving too far. Overreaction can be as bad or worse than no reaction in sketchy situations. Always use gentle motions when turning or applying the brakes. Sitting on a scooter with arms and legs stretched out is a very easy way to get a nasty sunburn! Driving in Southeast Asia can seem chaotic at times, but there is a method to the madness. Traffic follows an informal hierarchy, and so should you. The rules of the road are simple: The biggest vehicle always gets the right of way. Motorbikes fall near the bottom of the pecking order, just one notch above bicycles and pedestrians. Always yield to buses, trucks, cars, and larger motorbikes. Don't be angry or surprised when that truck pulls out in front of you — the driver is expecting you to go around or yield! The safest place to drive is always on the far edge of the slowest lane. If driving in a country that drives on the left side (e.g., Thailand), stay as far to the left as possible so that larger vehicles and more experienced drivers can pass you easily. Unfortunately, the far edge of the road is also where animals, rubbish, loose bricks, and other road hazards exist; keep your eyes on what is directly in front of you! Do as the local drivers do: use your horn liberally. Yes, it contributes to the chaos, but it's a vital part of the system. Tap your horn courteously a couple of times before passing people and when coming around sharp turns so that there are no surprises. Remember: Scooters are smaller and harder to see than cars. Other drivers may not notice your approach until you sound the horn. Many rental agencies in Southeast Asia siphon gas from returned rentals; it's a part of their fee. You may have to proceed directly for fuel. While petrol is commonly sold from glass bottles at roadside stalls, you'll pay far more per liter and may receive low-quality fuel. Always try to fill up at gas stations when they are available. Most gas stations in Southeast Asia are full service, but you won't be expected to tip. Choose a pump, park, and open the scooter for the attendant. You will pay and receive change directly from the attendant. Scooters have a limited range, and tourists frequently run out of fuel between fill-up opportunities in rural places. Locals may have fuel in large containers they bring from the city on supply runs. Plan ahead, and top up fuel as often as possible. Sadly, some agencies rent scooters until they literally fall apart; breaking down or experiencing a flat tire on the road is a common occurrence. Shops renew their motorbike fleets through tourists who crash or become victims of theft and are forced to pay for a new bike. Never rent from an individual offering you their personal motorbike. This is a common hustle in Bali, Laos, and Vietnam. Some nefarious scams include the same individual following you to steal back the bike with a spare key. They may blame you for small scratches that merit big repair bills. Occasionally, renting from an individual is the only way to get a scooter; this is often the case on islands in the Philippines. Always lock up your motorbike at night, and try to park in high-profile places. Don't leave your helmet hanging on the bike. Motorbike seats can be easily popped open with a flathead screwdriver. Don't leave valuables in the compartment. Check a motorbike carefully before driving away. Return to the agency immediately if you experience a problem with the tires, brakes, or motor. If you are forced to make emergency repairs somewhere, you probably won't be compensated later for fixing their motorbike!